Details relating to the Belgian Commemorative of 2014. This coin commemorates the 150th anniversary of the establishment of the Belgian Red Cross. In 1859 Henry Durant witnessed the battle of Solferino in Italy. Shocked by the carnage he saw and the lack of care for wounded soldiers, he started a movement that ultimately led to the Geneva Convention and the formation of the red cross. Belgium was one of the founding members of the first Geneva Convention in 1864. 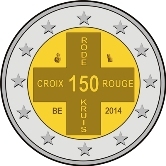 The motif of the coin is simple and elegant – the outlines of a cross with 150 in the middle and reading horizontally we have “croix 150 rouge” and vertically “rode 150 kruis” these being 150 red cross in French and Flemish (the two official languages of Belgium) respectively. The mark of the mint master, a cat, is in the upper left quadrant and the mint mark is in the upper right quadrant. The country designation BE is in the bottom left quadrant and the year of issue 2014 is in the bottom right quadrant. Return from Belgian Commemorative 2014 to euro coin collector.